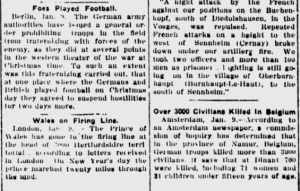 100 Years Ago today the Times reported the Christmas Truce side by side with reports of civilian killings in Belgium. Gettysburg Times, Jan. 9, 1915. Published in100 Years Ago today the Times reported the Christmas Truce side by side with reports of civilian killings in Belgium. Gettysburg Times, Jan. 9, 1915.